It was a sunny Saturday morning when Julia Vallera invited me to take part in a community-based art installation called Color Wheelz at Murray Playground in Long Island City. She was accompanied by Nick Normal from Flux Factory. Behind them was a white 1997 Ford van with colorful swirls throughout, and in front of them was a table filled with the necessary art materials. So, what is Color Wheelz exactly? It’s a not-for-profit project that illustrator Julia Vallera started as a MFA thesis at Parsons School of Design. She hopes to showcase culture through the local resident’s perspective, and provides materials—such as felt, fabric and vinyl—in various colors. “I want people to tell their story or how they see their community through color,” Vallera said. Color Wheelz invites everyone to share their perspective by posting their art work on the van, followed by a video recording of people explaining the inspiration of their work (my colors were black, different hues of blue and bright summer colors in the shape of the city view from LIC’s Gantry Park). With the help of Flux Factory, an arts organization “supporting innovation in things,” Julia Vallera is able to advertise Color Wheelz. It hasn’t been long, but the project has been well accepted by everyone; some 60 people participate every time. It’s impossible to miss because Normal places colorful triangles leading to the van. Many are intrigued and ask questions, but some, like the elderly man who participated with me, reminisce about the glory days and how much the community has changed through the years. 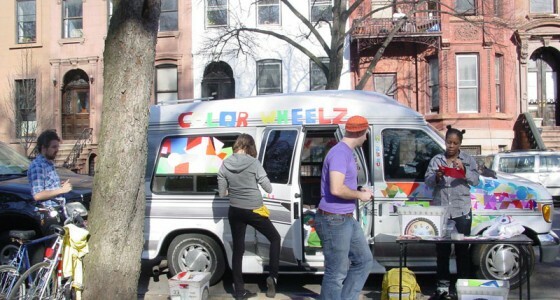 Color Wheelz hopes to explore many other communities in New York City. For more information about Flux Factory and Color Wheelz, please click here.